You can make these immediately after getting them mixed up, but they will be easier to do if you give the dough 30 minutes to rest and hydrate. Put the masa in a largish mixing bowl, and stir in the salt. Use your hands to knead the dough a bit to get it into a nice uniform, smooth ball. If it seems terribly dry, add more water, a tablespoon at a time, and if it seems really wet, add more masa, a tablespoon at a time. It should be pliable, and stick together well if you gently squeeze a piece between your thumb and fingers. If the edges are too crumbly, add more water, and if it doesn't hold it's shape when you squeeze it, add more flour. Wrap tightly in plastic wrap, and allow to rest, at room temperature for 30 minutes. You can leave it longer if you need to, but more than hour, it should go in the fridge. It's best to cook tortillas on cast iron - like a cast iron griddle, which is what I use, or a cast iron skillet. You can cook more at a time on the griddle. If I have a lot to make, I use my griddle and both of my skillets, but it's hard for one person to keep up with that many at a time. If all you have are stainless steel skillets, they will work, though you might have to oil them very lightly. Don't use non-stick, as it is not safe to heat empty non-stick cookware to the temperature needed to bake the tortillas. This amount of dough will make about 12 6 inch tortillas - you can divide the dough, and roll each piece into a nice round ball, and then press each one right before you put them on the griddle. Line your press with plastic - I cut open a heavy duty ziplock type bag, because they hold up better. Put the plastic bag on the press, with the seam that was the bottom of the bag toward the hinge. Place one of the dough balls on the press, fold over the plastic, and press with your fingers to flatten it a bit. Close the press, and gently fold the handle over a little - don't try to flatten it completely at first. Flatten it a bit, open the press to see where the tortilla is, and adjust it so that it's more in the middle. Press a little more, and adjust again if needed, before finally getting the handle all the way down. I usually look at it 3 times and even turn the whole plastic and tortillas around to get it to press evenly. 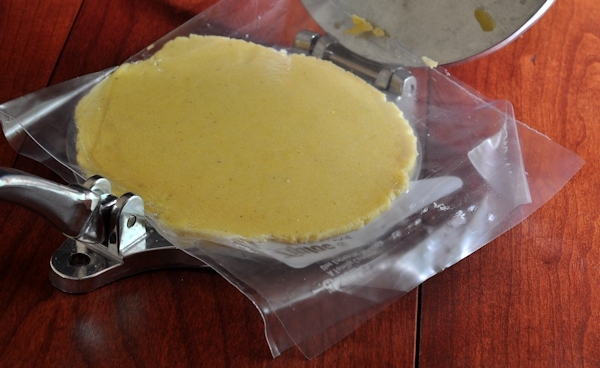 Once it is flattened out to the size of the press, carefully open the press, and pick up the plastic bag and tortilla - carefully peel the plastic off, and reuse it for subsequent tortillas. Place each tortilla on the preheated griddle or skillet. The heat should be on the high side of medium - each side of the tortillas will take about a minute to 90 seconds to cook if you have the heat set correctly. They should have some nicely browned spots on each side. Place the cooked tortillas on a plate, cover with a damp paper towel and a folded over kitchen towel to keep them warm and to prevent them from drying out. Once you get a rhythm going you can probably have a fresh tortilla pressed to take the place of each one that you remove from the griddle - if not, it won't hurt anything for the griddle to sit empty for a few moments. Keep the tortillas warm if you are going to eat them right away - they will keep tightly wrapped in the fridge for the better part of a week. You can freeze them as well, but the quality will suffer a bit.